Our friend Marcel Brosens from Mannen met Plannen graduated from AKV | St.Joost. Marcel made a piece which I really like. 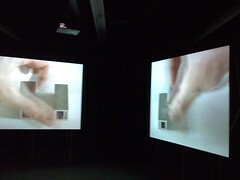 What you are confronted with are two simultaneous projections which are most of the time out of and sometimes in sync. Unfortunatly I didn’t make a movie, but see the photo and listen to the sound file (1:32), and you know what I mean. Marcel is participating in #Debuut09, together with about 40 other new artists. Fr – Su, Jul 24th – Sep 1st, Delden. Find out more on www.mikc.nl.